Favorite sports announcer is Davey Lopes: Cal Ripken also listed Lopes as his favorite. 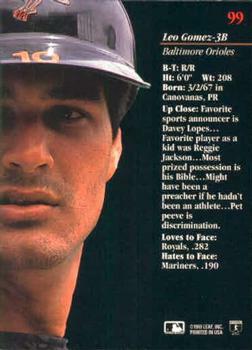 Lopes was the Orioles first base coach at the time. I find nothing online to indicate that Lopes was an announcer. Favorite player as a kid was Reggie Jackson: Popular choice for someone his age. Most prized possession is his Bible: Second straight card with this answer. Might have been a preacher if he hadn’t been an athlete: Seems like religion was serious for Gomez. His pet peeve is discrimination: A more socially-conscious answer to this question than what you usually see. Where he is now: He was managing in the Orioles organization in 2011 when he was interviewed by The Greatest 21 Days. Not sure where he is now. Traded Al 50 1978 commons for a bunch of cards. He wants more but I have some trader buddies I'd rather get the cards first, so it will have to wait until those trades complete. Here is the non-shiny section, including a lot of Yankees, some Collect-A-Books, and one vintage card. And here are the shinies. I think those Sterling cards in the upper left are my favorite. Traded Al a bunch of 70s cards, mostly commons but a few Yankees and a '78 Nolan Ryan. In return, a whole bunch of gold parallels. Note there are two LaTroy Hawkins 2008 cards, if anyone needs one. I also picked out a few random goodies from the binder. This trade was on April 25th; I didn't notice that the Yankee Stadium Legacy card was also dated April 25, though from 65 years earlier. Finally, a couple of really nice vintage cards, a Hall-of-Famer and a Yankee star. I've done a few street trades lately, got to catch up on posting them. These all came from the back of his binder, which have a lot of random odds and ends. A few years ago Upper Deck put out a Yankee set which included a few cards of New York landmarks. I needed the Times Square and Central Park cards; he threw in the Empire State Building and Statue of Liberty but I already had them so they are available if someone wants to trade for them. A couple of other random cards - one is from one of the few New Yorker president, Chester Arthur and his wife Ellen, as well as a card with the Declaration of Independence. The older the better. One more post from the great package I got from Johnny's Trading Spot. Awesome to get another Hall-of-Famer in the '67 set. My first Curt Flood card. I love the paint sign in the background. Oldest card in the package - a 1959 Woody Held. I didn't have any 1961s before (except for one manager card). The design is simple but very nice. The photograph really takes center stage - 1961s really look great. Someone punched a hole in this one. I don't care - damaged vintage is still awesome. Checklist looks great too, with the action shot. My first ever 1964s, including Mets Hall-of-Famer Duke Snider. Also a 1965 snuck into the picture. Breaking up the vintage cards Johnny sent into two posts because there is just too much awesomeness . . . The biggest chunk of cards that Johnny sent came from the 1975 set, about 75 cards. Lots of photos taken at the Expos spring training field with the big Coca-Cola sign prominently in display. Here is an error card for Mike Cuellar. This photo reminds me of early-1980s Fleer. George Mitterwald wiping dirt out of his eye. Reminds me of the card of Vance Law cleaning his sunglasses. Weird to see Reggie Jackson wearing #9. I did not know that he didn't start wearing #44 until he joined the Yankees. What a fantastic group on this card. Well-known baseball veterans (John Roseboro; Jimmie Reese); great names (Winkles, Salty). The "other guy", Tom Morgan, pitched in three World Series for the Yankees and was the pitching coach credited with making Nolan Ryan a star. I love '70s team cards. No hats here! Great photo here. You can see in the back the fans already starting to jump out of the stands to storm the field. Sure, it's a miscut, but it's awesome to get this iconic card. Speaking of 1974 Padres cards, here is my first ever "Washington Padres" card. Finally, some big names from the early 1970s. I recently won a little contest from Johnny's Trading Spot where he said he would get some "trinkets" from his next card show. These are some really nice trinkets. A couple of autographed minor league cards. I've interviewed Kennedy for this blog so I really like getting that card. Lots of vintage! 1970s . . .
. . . and 1960s! Johnny threw the trinkets into a huge box of vintage for a trade that we did, I will cover that trade in some future posts . . . Finally completed the opening day street trade with Al, kept waiting for him to bring his new binder. This turned out to be Topps cards of the late 2000s early 2010s; predominantly 2014. Not a good picture but three of these four cards are shiny. The Adam Jones is a refractor. The Brandon Phillips card is numbered to /99. Some various parallels, as well as current Yankee Sonny Gray, one of Brian Cashman's many recent bad decisions. Dylan Axelrod pitched for the White Sox and Reds from 2011 to 2015. In 59 games (34 starts), he went 9-15 with a 5.27 ERA. Now a youth baseball coach in Atlanta, he kindly answered my questions about baseball cards. "I was a big collector as a kid. My favorite player was Ken Griffey Jr. I loved buying packs generally for the unknown and excitement of what might be within. Whenever I got a KG Jr card I put it in its own special binder. The 89 UD rookie was my holy grail but packs were $10 back in those days and I never bought them. I always wanted that card! Fast forward 20 years or so and I had told this story to my fiancé (we named our puppy Griffey and the story came up). My fiancé started buying me packs one in awhile. No luck! Then as part of her wedding gift to me, boom she bought me a PSA 10 autographed 89 KG Jr rookie. Holiest of the holy grails. Mind blown"
Outfield: Frank Robinson, Aaron Judge, Willie Stargell. I think of Stargell as a 1B but he actually played more games in the outfield during his career. I stuck Judge in center as he played a bit there this year. The infield has Yankees on the corners, and Mets up the middle. Boggs, Harrelson, Samuel, Mattingly. Overall my all-autograph team is weaker up the middle then on either side of the diamond. Boggs beat out Brooks Robinson just because he's a Yankee. That card is a DefGav custom. Catcher is Bill Freehan, who had a solid career, though the autograph is a bit faded here. For whatever reason my pitching staff is much weaker than the lineup. I picked one starter, Mike Scott, and one reliever, Dave Righetti. Neither had a lot of competition. Hobby is golf: Dykstra used to live in the same golf-course community as Wayne Gretzky. Favorite sports announcer is Harry Kalas: Kalas was a long-time Phillies announcer. 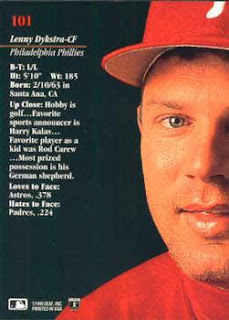 Favorite player as a kid was Rod Carew: Dykstra grew up in Anaheim watching Carew on the Angels. Most prized possession is his German shepherd: One of Dykstra’s listed assets on his 2009 bankruptcy filing was a $10,000 German shepherd. Where he is now: His post-career legal issues and other shenanigans have been well-publicized. Favorite sports announcers are Vin Scully and Chick Hearn: A two-sport star in college, the Los Angeles native picked announcers from the LA Dodgers and LA Lakers. 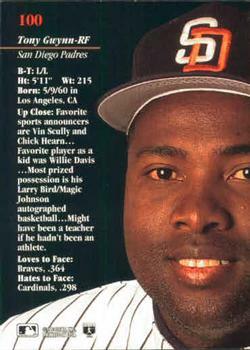 Favorite player as a kid was Willie Davis: Gwynn and Davis are in the Idols subset of 1992 Pinnacle. Most prized possession is his Larry Bird/Magic Johnson autographed basketball: Today basketballs signed by both NBA stars sell for over $500. Might have been a teacher if he hadn’t been an athlete: Gwynn was a great teacher of hitting. Post-playing career: After his career he was head baseball coach as SDSU. He died of cancer in 2014. This is my vintage project. It will track how far along I am in each pre-1978 set. It is financially unreasonably for me to try to complete these sets, but collecting vintage is too fun not to do. So instead of a “want” list, it is a fun project to see what I accumulate through trades, occasional purchases, etc. This list will reside permanently on the upper right corner of this blog, with the other wantlist and tradelist. For each set is my HAVE list – any cards not on the list I will happily take in trade. I am listing Topps sets first, then after that various miscellaneous sets. I am not picky about condition and would be happy to trade for your beat-up, worn-out cards. 1969 Topps: Looking closer . . . So I am a vintage collector now . . .
A teaser . . .
1993 Studio Ken Griffey Jr.